"What RPG Cover Best Captures the Spirit of the Game?" For me, the answer to that question has always been CHILL by Pacesetter. It's a highly underrated game that captures the tone of my favorite horror films, those of Hammer Studios. In 1984 a group of former TSR Employees -- including Mark Acres, Troy Denning, and Stephen Sullivan -- formed Pacesetter Ltd. Games and released the Chill role playing game. Chill wasn't the first horror role playing game, nor was it the best, but it has long held a place as a "cult" favorite in the role playing game world. Where other horror role playing games sought to capture the dark nihilistic material horror of H.P. Lovecraft, or the gruesome horror of many films, Chill tried to capture the tone of Hammer and AIP productions. Because of its focus, and because its creators were former TSR employees, Rick Swan reviewed the game quite negatively in Dragon magazine and in his Complete Guide to Role-Playing Games. He described the game as, "A horror game for the easily frightened...While most of Chill's vampires, werewolves, and other B-movie refugees wouldn't scare a ten-year-old, they're appropriate to the modest ambitions of the game...Chill is too shallow for extended campaigns, and lacks the depth to please anyone but the most undemanding players. For beginners only." Swan was correct that the game was simple, and appropriate for beginners, but he was far from the mark when he claimed that it lacked depth that could appeal to demanding players who want extended campaigns. The game has solid underlying mechanics that encourage a loose style of play that encourages storytelling over combat and reduces the dependency on die rolls that so many role playing games often overly promote. Like many Pacesetter games, Chill is innovative and slightly ahead of its time -- nowhere is this more the case than with their Chill: Black Morn Manor board game -- but like many things ahead of their time there are some flaws to the mechanics. Nothing too big, but definitely things that might make some gamers reject it out of hand. The game is simple enough that a group of players can pick up the rules and start to play within 15 minutes...from scratch. Let me repeat that. This game, made in 1984, is easy enough to learn that a group can open the box and begin playing within fifteen minutes. Given how complex rpgs seem to the non-gamer, this is quite a marvelous achievement in and of itself. 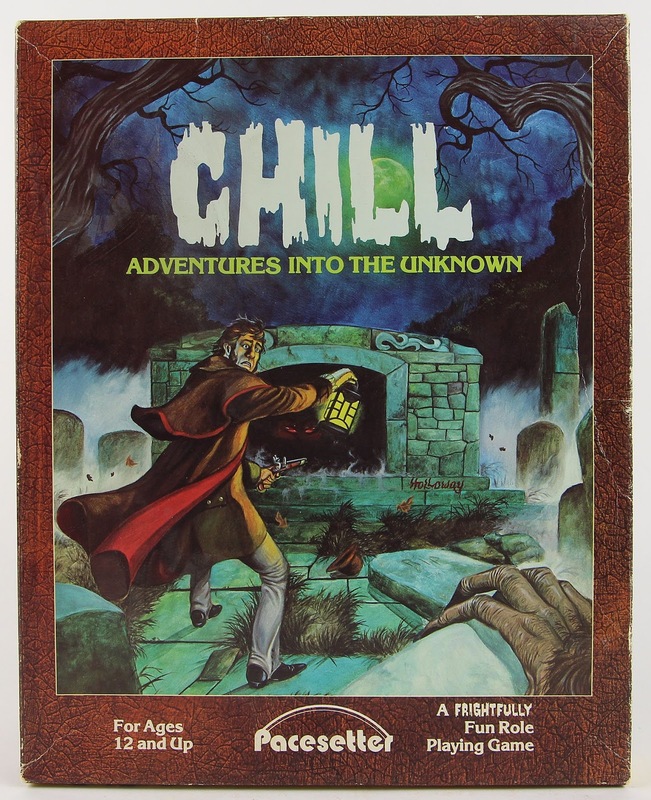 Chill is the first to include an introductory folder advising players to begin playing that adventure before they've read the rules of the game! To begin, players have only to read a four page READ-ME-FIRST! introduction to the rules, pick up the 16-page adventure booklet and begin playing! And, sure enough, the cockamamie scheme works! Spector's final word on the game is that it "falls somewhat short of the mark," but his analysis is clear and he seems to understand that he is looking at something new here. There are many games from the 80s that -- mechanically and tonally -- seem extremely dated by modern gaming standards. Chill -- the first Pacesetter edition -- isn't one of them. It has a kind of classic feel to it, just like all the Hammer and AIP movies it was inspired by. It isn't a dark and serious horror game, but it is an adventurous one. If you want to experience existential horror, you can do no better than Call of Cthulhu, but if you want to pretend to be Peter Cushing's Van Helsing hunting Christopher Lee's Dracula you want Chill.